pour the lime juice about 1/3 of the way up into each of 10 popsicle molds. Freeze the molds until the layer is almost frozen solid, then remove and place a stick into each mold, anchoring it into the lime layer. Return the mold to the freezer and freeze until completely solid. To make the white layer, whisk together the coconut milk and the sugar until smooth. 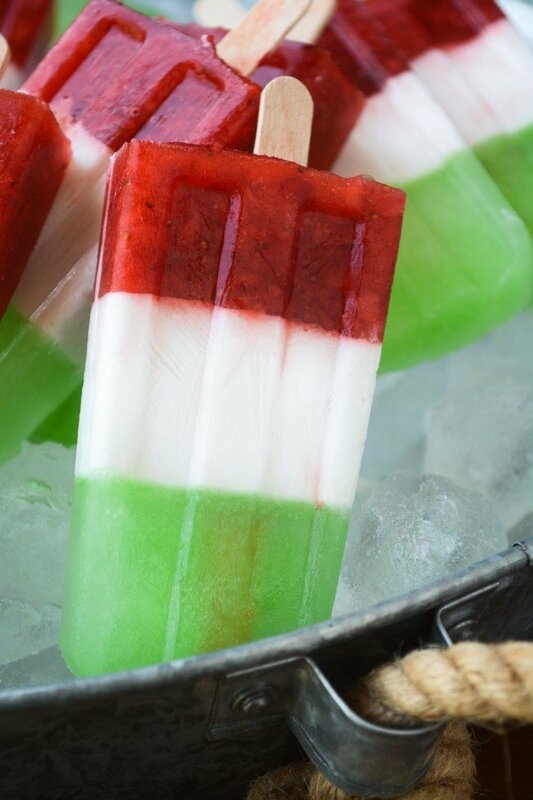 Pour the coconut milk into each popsicle mold, filling it another 1/3 of the way. Return the mold to the freezer and freeze until completely solid, about 2 hours. For the last layer, whiz the strawberries in a small food processor. Add a little bit of water to make about 1 1/3 cups. Top off each of the molds with the strawberry mixture, and return to the freezer to finish freezing. When ready to eat, unmold the pops by filling your sink with hot tap water and immersing the mold up to, but not over, the top lip for about 15 seconds. Remove the popsicles and eat immediately, or wrap in waxed paper and place in freezer baggies to store for later.